Cody Willoughby | AIM Media Midwest Hundreds of third graders enjoy burgers and fries during the Valentine’s Day Sock Hop on Thursday at Springcreek Primary in Piqua. Cody Willoughby | AIM Media Midwest Mrs. Ashton’s first grade class takes a photo with the giant milkshake during the Valentine’s Day Sock Hop on Thursday at Springcreek Primary in Piqua. Cody Willoughby | AIM Media Midwest Second graders Addison Leonard and Abigail Detter enjoy the lively goings-on during the Valentine’s Day Sock Hop on Thursday at Springcreek Primary in Piqua. Cody Willoughby | AIM Media Midwest Volunteer Trisha Elliott adjusts the ribbon of first grader Karlie Elliott during the Valentine’s Day Sock Hop on Thursday at Springcreek Primary in Piqua. Cody Willoughby | AIM Media Midwest First graders Samuel Baumhauer and Kallie Anderson pose in ’50s attire during the Valentine’s Day Sock Hop on Thursday at Springcreek Primary in Piqua. Cody Willoughby | AIM Media Midwest First grader Connor Hamby takes a bite of his cheeseburger while dressed in ’50s attire during the Valentine’s Day Sock Hop on Thursday at Springcreek Primary School in Piqua. Grades K-3 were invited to eat burgers and fries in a ’50s-themed cafeteria, featuring ’50s music and staff members in ’50s attire. A poster-sized heart was hung to represent each class, signed by every student with a message about what they like most about their class. The sock hop ran in conjunction with a similar event at Washington Primary. For more information on school events, visit www.piqua.org. 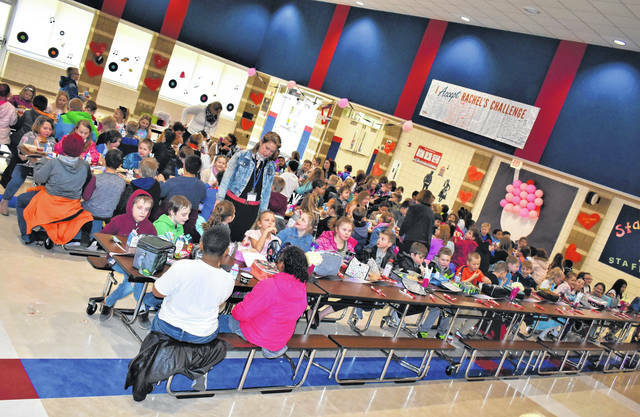 Hundreds of third graders enjoy burgers and fries during the Valentine’s Day Sock Hop on Thursday at Springcreek Primary in Piqua. Mrs. Ashton’s first grade class takes a photo with the giant milkshake during the Valentine’s Day Sock Hop on Thursday at Springcreek Primary in Piqua. Second graders Addison Leonard and Abigail Detter enjoy the lively goings-on during the Valentine’s Day Sock Hop on Thursday at Springcreek Primary in Piqua. 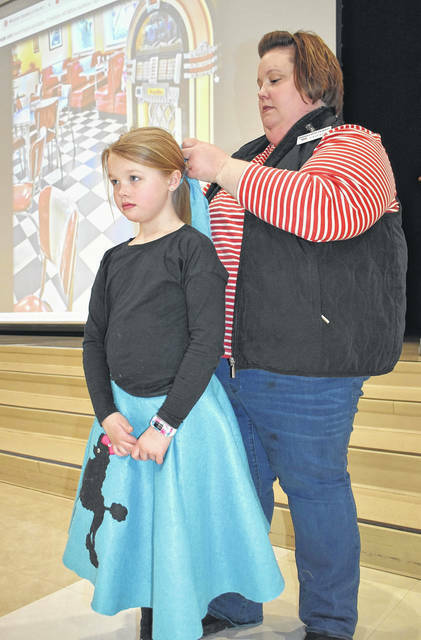 Volunteer Trisha Elliott adjusts the ribbon of first grader Karlie Elliott during the Valentine’s Day Sock Hop on Thursday at Springcreek Primary in Piqua. First graders Samuel Baumhauer and Kallie Anderson pose in ’50s attire during the Valentine’s Day Sock Hop on Thursday at Springcreek Primary in Piqua. First grader Connor Hamby takes a bite of his cheeseburger while dressed in ’50s attire during the Valentine’s Day Sock Hop on Thursday at Springcreek Primary School in Piqua. Grades K-3 were invited to eat burgers and fries in a ’50s-themed cafeteria, featuring ’50s music and staff members in ’50s attire. A poster-sized heart was hung to represent each class, signed by every student with a message about what they like most about their class. The sock hop ran in conjunction with a similar event at Washington Primary. For more information on school events, visit www.piqua.org. 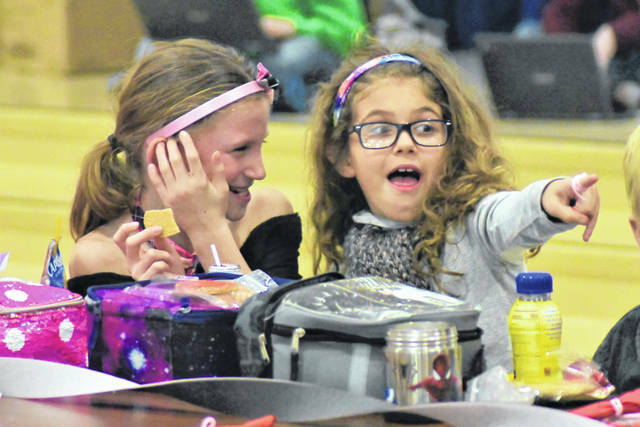 https://www.dailycall.com/wp-content/uploads/sites/30/2019/02/web1_SockHop6.jpgCody Willoughby | AIM Media Midwest Hundreds of third graders enjoy burgers and fries during the Valentine’s Day Sock Hop on Thursday at Springcreek Primary in Piqua. 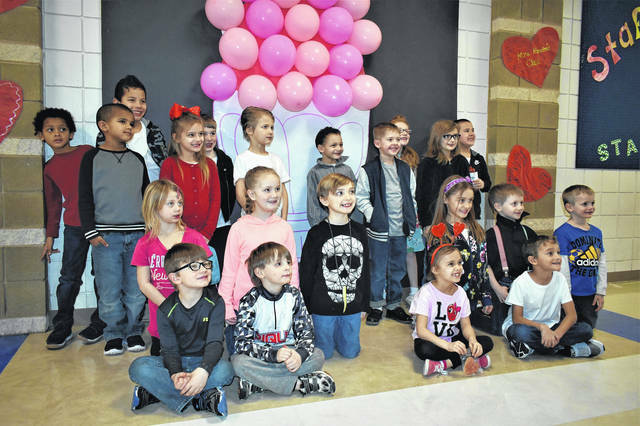 https://www.dailycall.com/wp-content/uploads/sites/30/2019/02/web1_SockHop4.jpgCody Willoughby | AIM Media Midwest Mrs. Ashton’s first grade class takes a photo with the giant milkshake during the Valentine’s Day Sock Hop on Thursday at Springcreek Primary in Piqua. https://www.dailycall.com/wp-content/uploads/sites/30/2019/02/web1_SockHop5.jpgCody Willoughby | AIM Media Midwest Second graders Addison Leonard and Abigail Detter enjoy the lively goings-on during the Valentine’s Day Sock Hop on Thursday at Springcreek Primary in Piqua. https://www.dailycall.com/wp-content/uploads/sites/30/2019/02/web1_SockHop3.jpgCody Willoughby | AIM Media Midwest Volunteer Trisha Elliott adjusts the ribbon of first grader Karlie Elliott during the Valentine’s Day Sock Hop on Thursday at Springcreek Primary in Piqua. 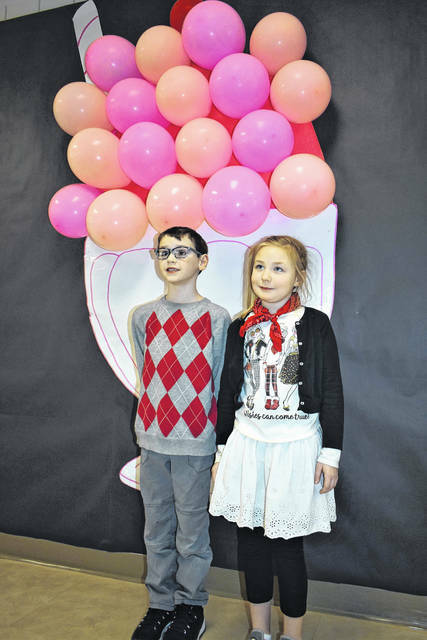 https://www.dailycall.com/wp-content/uploads/sites/30/2019/02/web1_SockHop2.jpgCody Willoughby | AIM Media Midwest First graders Samuel Baumhauer and Kallie Anderson pose in ’50s attire during the Valentine’s Day Sock Hop on Thursday at Springcreek Primary in Piqua. 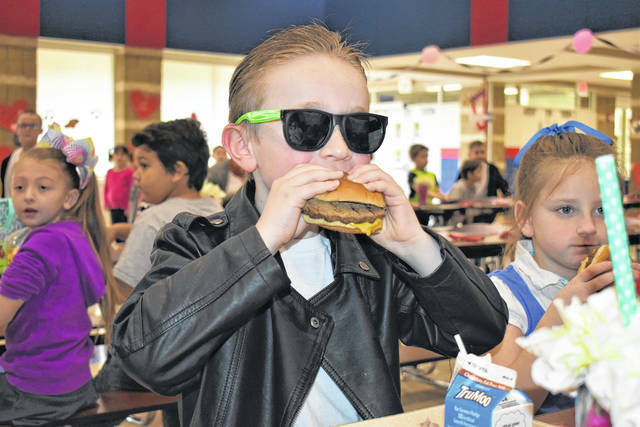 https://www.dailycall.com/wp-content/uploads/sites/30/2019/02/web1_SockHop1.jpgCody Willoughby | AIM Media Midwest First grader Connor Hamby takes a bite of his cheeseburger while dressed in ’50s attire during the Valentine’s Day Sock Hop on Thursday at Springcreek Primary School in Piqua. Grades K-3 were invited to eat burgers and fries in a ’50s-themed cafeteria, featuring ’50s music and staff members in ’50s attire. A poster-sized heart was hung to represent each class, signed by every student with a message about what they like most about their class. The sock hop ran in conjunction with a similar event at Washington Primary. For more information on school events, visit www.piqua.org.